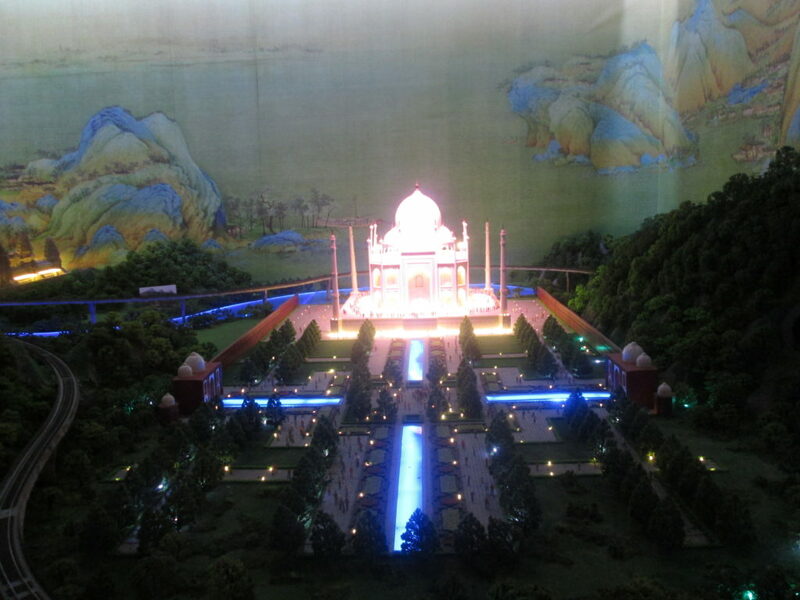 I viewed it during previews, a few days before the official opening. At that time, not all the technology features were fully functional, but most were and I was thoroughly impressed and want to return. My son saw the photos and is begging me to go. 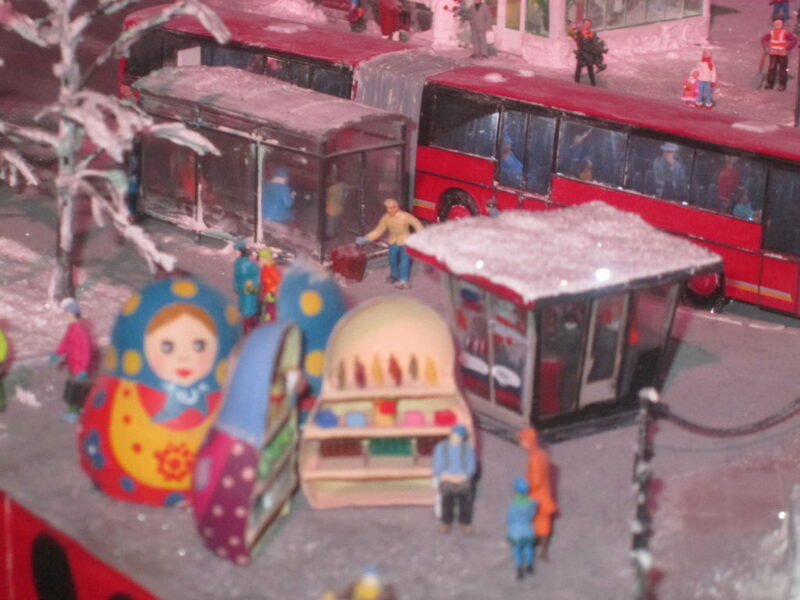 Models from the “scenes” (U.S., Europe, Russia, Latin America, the Middle East and Asia) were created in the actual locations, by local model makers (look for their signs in those lands – some are easier to spot than others). These model makers had the latitude to create what they thought was appropriate for their land. That means that the Manhattan skyscrapers are not accurate representations on top – the tops sort of fade into a plain outline while the bases are detailed. That’s not how skyscrapers in Asia, for example, are depicted. Those are detailed in their entirety. Some of the buildings are made with 3-D printers, and others (like the Russian ones) were hand-carved. Landmarks and cities aren’t created in accurate formations (you’ll see the Lenape tribe in their natural environment by the base of the Brooklyn Bridge, exhibited not far from the blinking lights and videos of Times Square, while a boater paddles around an NYC fountain), but you’ll recognize key landmarks and see some up close you may not have visited in person. 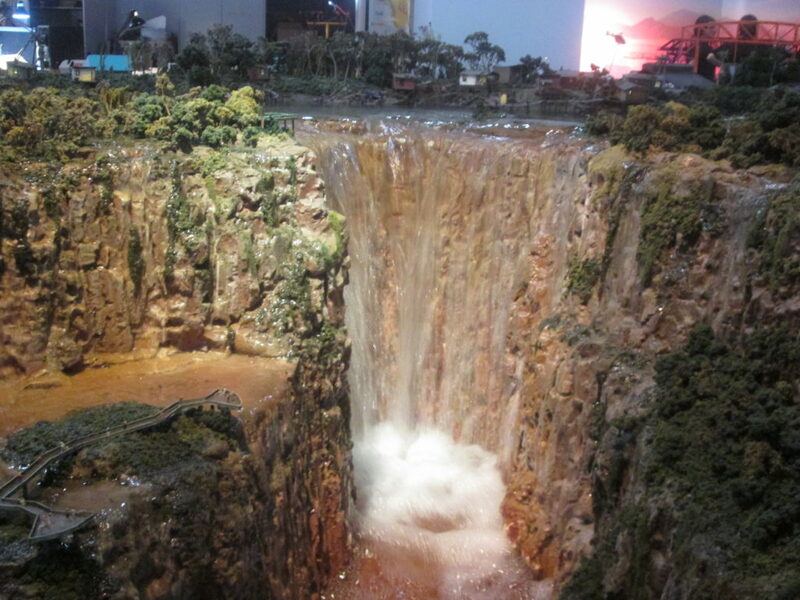 Model makers got the job a lifetime (in my opinion) to create this expanding exhibit. 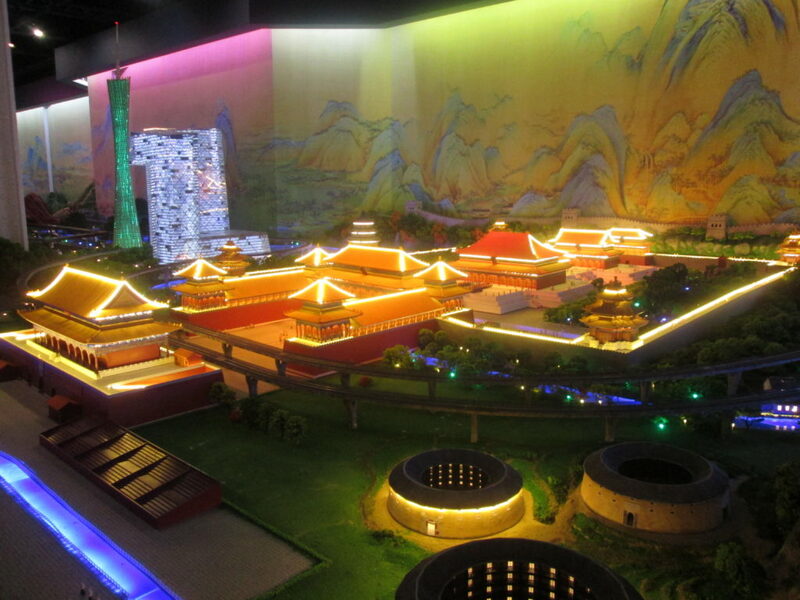 The brainchild behind Gulliver’s Gate is Eiran Gazit, who created a 14 acre Mini Israel in 2002. Maybe this explains why the Jerusalem scene at Gulliver’s Gate is enormous (granted, it’s similar in size to Manhattan’s depiction). 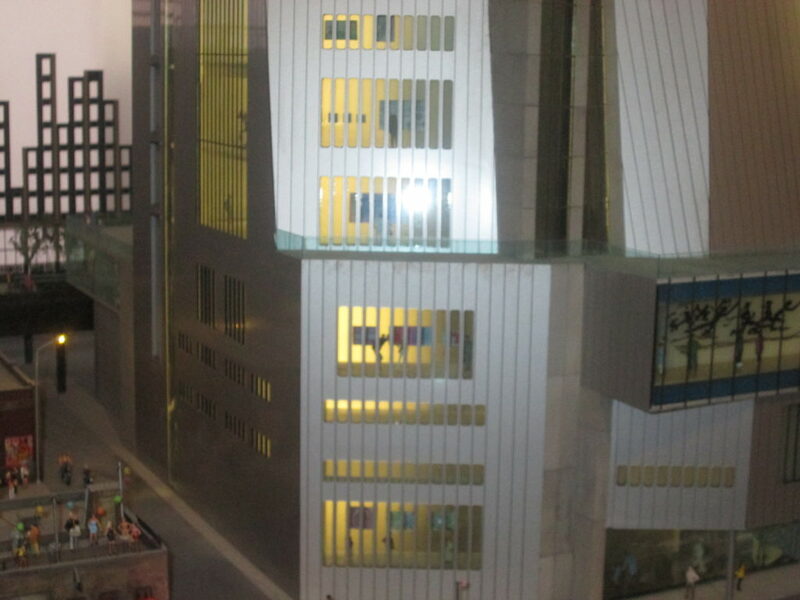 If you’re wondering whether these types of models are unique as a tourist destination, look to Germany’s Miniatur Wunderland. Watch their video – I’d love to visit there too. 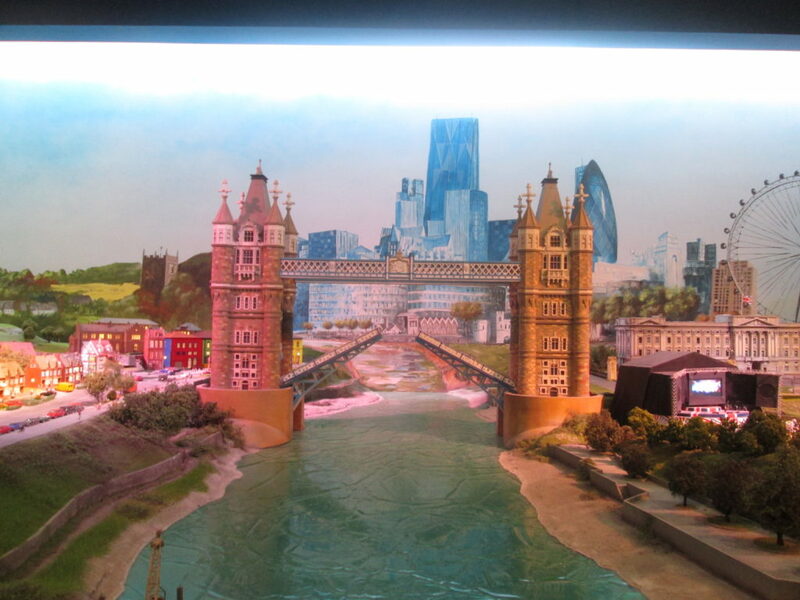 Gulliver’s Gate took about 18 months to assemble (and it was still being tweaked during the previews). Work will continue and the models will expand. They have several work areas you can see up close. 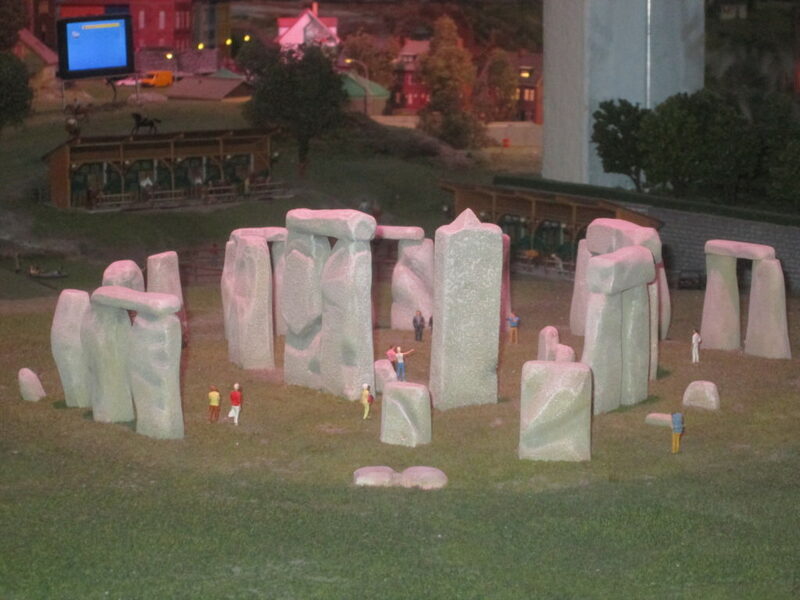 It’s not just that there are miniature versions of these landmarks. You’ll see self-driving cars, tiny lit-up lamp posts, skiers going down the mountain near Sochi in Russia, blinking lighthouses and turning carousels. You’ll see the Chunnel train moving between Britain and France, and tiny chickens, barely larger than a pinhead, pecking their meal. Some of this is activated by visitors. You’ll get a large key when you enter. This key will activate certain things, like the chickens pecking in the chicken coop, and the concert scene in England. There you can choose from several concerts (rumored to be Adelle, Queen, Rolling Stones, Beatles and the Clash). 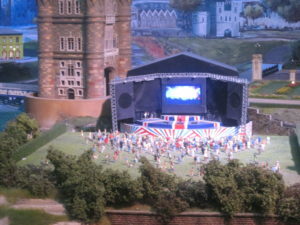 You’ll see video and hear music from that concert on the tiny stage, as the concert-goers pulse up and down on the lawn. Some of the cars in the exhibits move, and they’re not wired. They run on infrared, and self-charge as they go. One of the ambassadors picked up the car to show us, and then put it down in a different spot, where it continued driving. 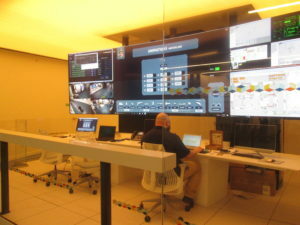 Partway through the exhibit you’ll see the control room, an open area with big screen monitors. These employees are monitoring and running the exhibits. You apparently can ask them questions and talk to them, but when I was there, they weren’t paying much attention to the guests. The details are stunning, and there’s a lot of surprising things to find as well. 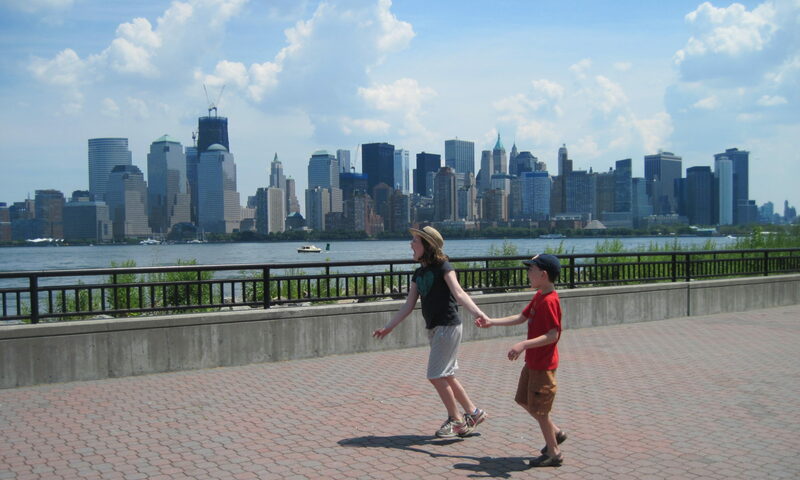 Look for “Easter eggs” – like Spider Man on the Brooklyn Bridge. Batman is on the top of one of the skyscrapers. Where’s Waldo is in the Northeast U.S. on a mountain top near the ski slope. On the opposite side, near the cabin is Smokey Bear. The Beatles are cross Abbey Road. There are a bunch of weddings. A mummy is chasing tourists outside of Cairo’s great pyramids. Additional opportunities is a nice way of saying extra ways you can spend money. Near the control room, an employee will stop you by a green screen to take your photo and “shrink you down.” The printed photos are available for purchase toward the end. 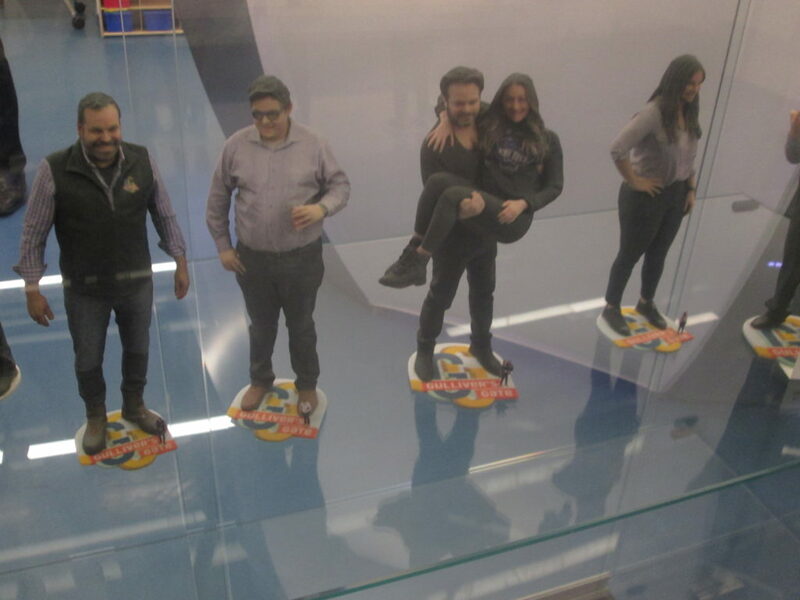 Also in that area, you can shrink yourself down in a 3D scanner, creating a tiny 3D printed version of yourself that they will place in one of 20 scenes. The cost for that privilege is $44 and you become a “model citizen.” You can get a larger version of yourself shipped to you for $130-290. I’m not really sure why anyone would want that, but apparently it’s been very popular. 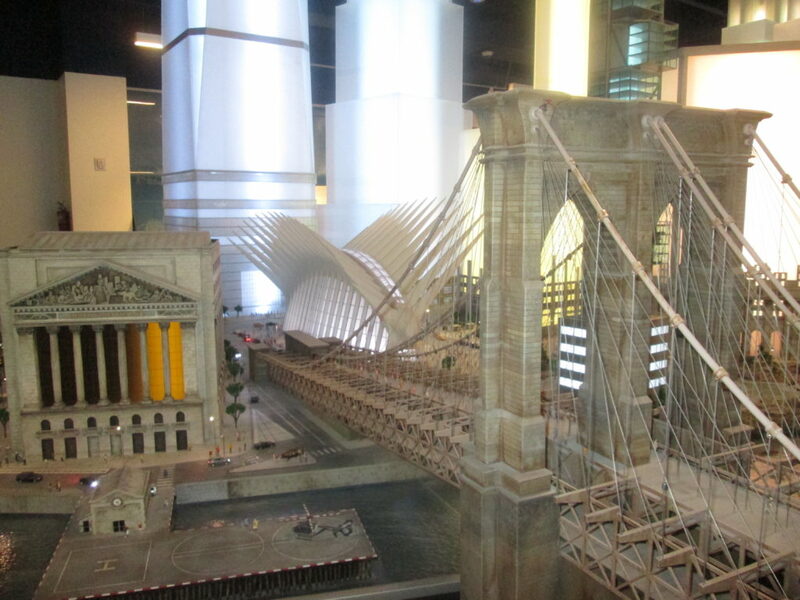 Ironically, Manhattan’s model was made in Brooklyn, with 16 artists creating the scenes. It took almost a full year to make the city. Manhattan blends current (the new World Trade Center transit hub) with the old (the West Village as depicted in the 1800s). You’ll see video billboards in Times Square, a Macy’s Thanksgiving Day Parade that moves, a rooftop trapeze at Pier 40 and a lot going on in Grand Central Station. Find the tightrope walker, the purse dropped on the train track, police checking out a suspicious package and the subway musicians. Look outside the Empire State Building at the robbery. Look at the Wall Street bull statue – across from it is the controversial Fearless Girl. There’s a lot more to see (including auto accidents), but you’ll have to spend some time investigating yourself. New England is next. The cities and towns are not accurately depicted, as the ambassador told me that they didn’t want to get in legal trouble. But you’ll see various seasons and the activities done then – fishing, skiing and hiking. The ski lift moves, and you’ll see actual skiers coming down the slopes. Look for Waldo to the left of the ski slope, and Smokey Bear is near the hunting cabin on the far right. Across from New England is Niagara Falls, the only display without people. While the depiction, taken from a drone photo, is stunning (along with the real mist), they have a weird thing where you can get your photo taken for free, and then the falls turns into a group of photos of guests. I thought that was silly, unattractive and didn’t add anything to the exhibit, other than maybe it will entertain young children. But that’s me! The British Isles has a large section in the next room, starting with the Edinburgh castle. In the lake, look for the Loch Ness monster to rise out of the water (it wasn’t functional when I was there). Pay attention to the tiny cameras clicking and flashing when this happens. You’ll see the Mayflower in Plymouth Harbor, before it makes its journey to what becomes the U.S. In England, unfortunately there’s no Harry Potter section, but you can use your magic key and activate a concert, like Adelle, Queen, the Rolling Stones, the Beatles or the Clash. The crowd moves up and down as they watch the concert. Buckingham Palace is present as well. There’s no changing of the guard, but reportedly the queen comes out, gets in a car and drives away (again, not functional when I was there). Look for the haunted house with zombies in the far right corner of the U.K. closest to where you’ll turn. The London Bridge opens and closes, so watch for that. 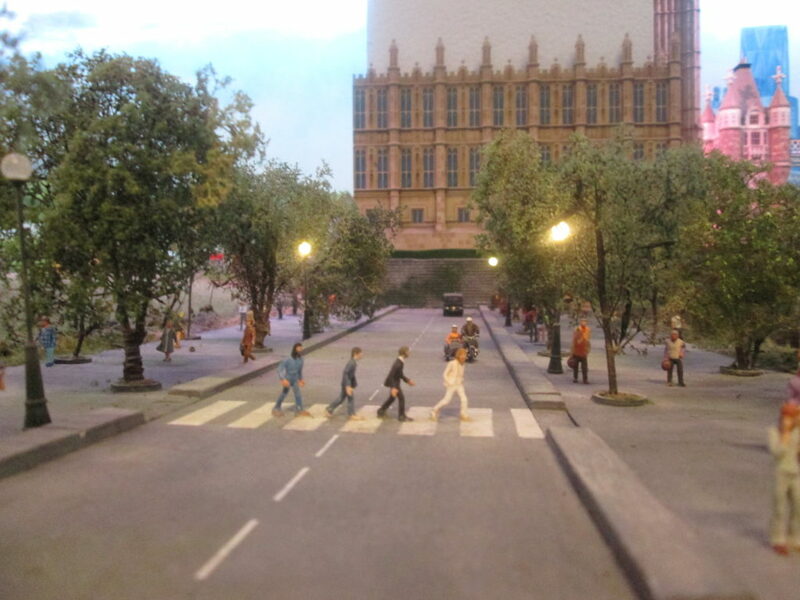 And of course there’s Abbey Road – good for a photo! Watch the Chunnel train go through England, and the light flashes across the floor as it symbolically moves to Europe. It will then appear in Europe and continue moving. Europe was made in Italy, taking 10 model makers 154 days. When facing it, look in the top right corner and watch Zeus rain down upon Mt. Olympus. Apparently you can see Zeus’ face in the mountain. Again, not functioning during previews. Look for the boats and gondolas to move in the lake there. Check out the bull ring in Spain. It turns. The bull holds the red cloth for the toreador. 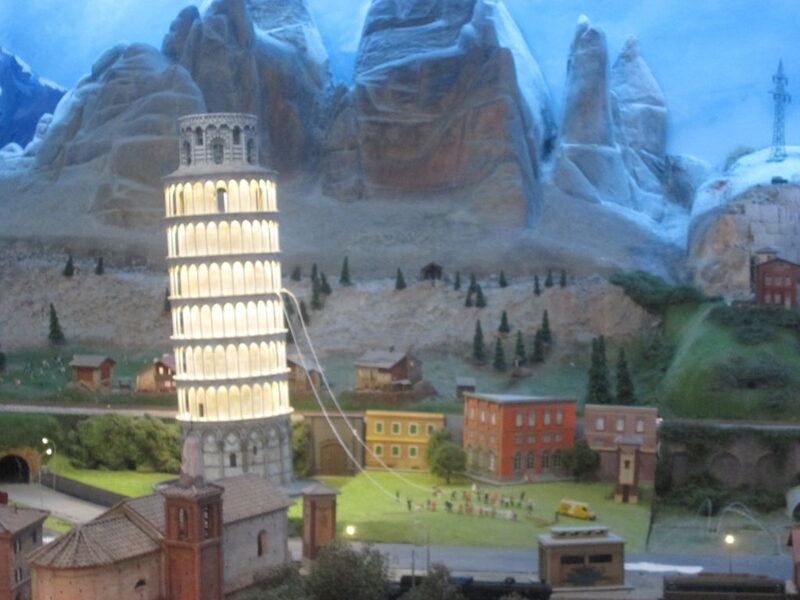 There’s a lot to see in Europe, like people trying to prop up the tower of Pisa. In Finland, after you turn the corner, you’ll see Santa on a sleigh in the sky (moving – I didn’t see it) and the Aurora Borealis. The carousel turns in the European fair too. 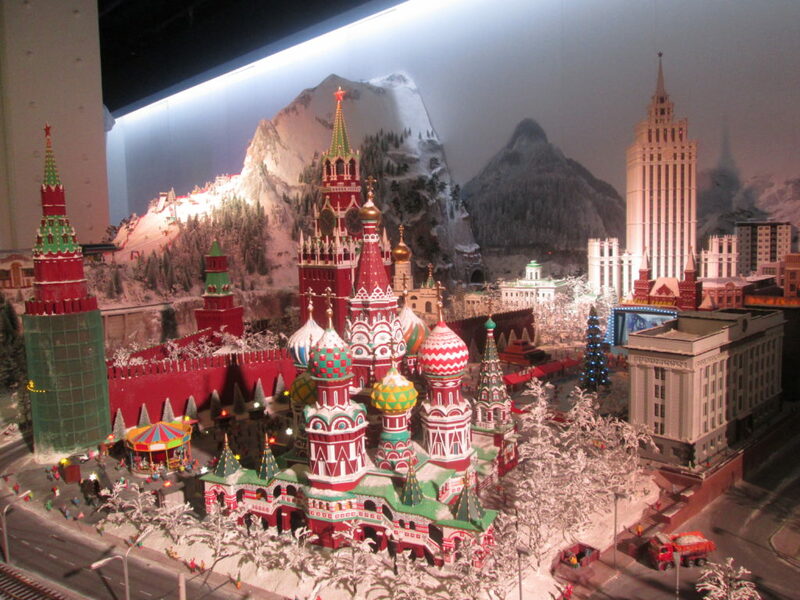 The Russian model was done in St. Petersburg, employing 26 model makers for 158 days. The model makers did lots by hand, versus 3D printing used elsewhere. In Sochi, toward the front, you’ll see some marksmen. When they shoot, you’ll hear the shot and see a flash! Look for the skiers on the mountain. And look for some animals doing unusual things (photo hint below). There are snowmobilers moving. And the Russian movie theater will have a movie playing. Look for the bear crossing the street (it’s at the front of the display), and see the Christmas market (which I didn’t realize they have in Russia). The cars move in Russia, and they have some good trains there as well. 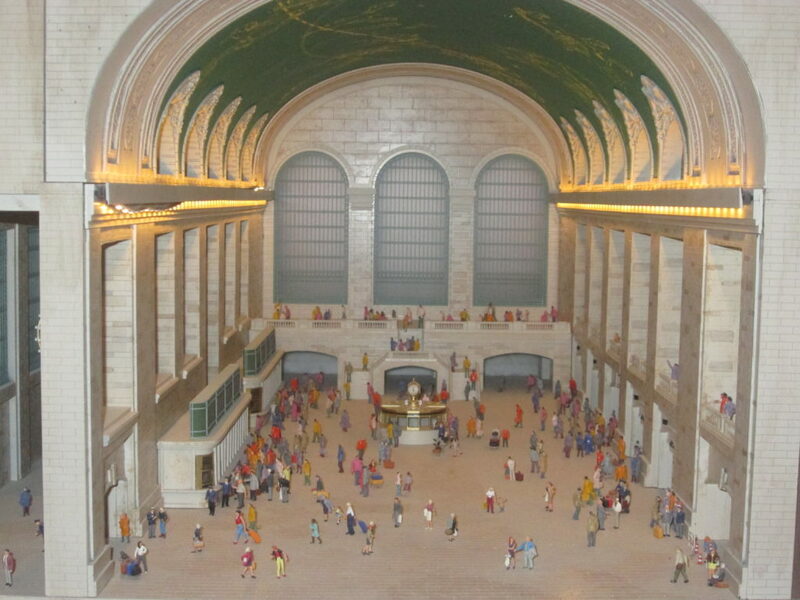 The Asian section was made in China (that sounds appropriate), using 29 model makers, in 178 days. The Asian section was gorgeous. 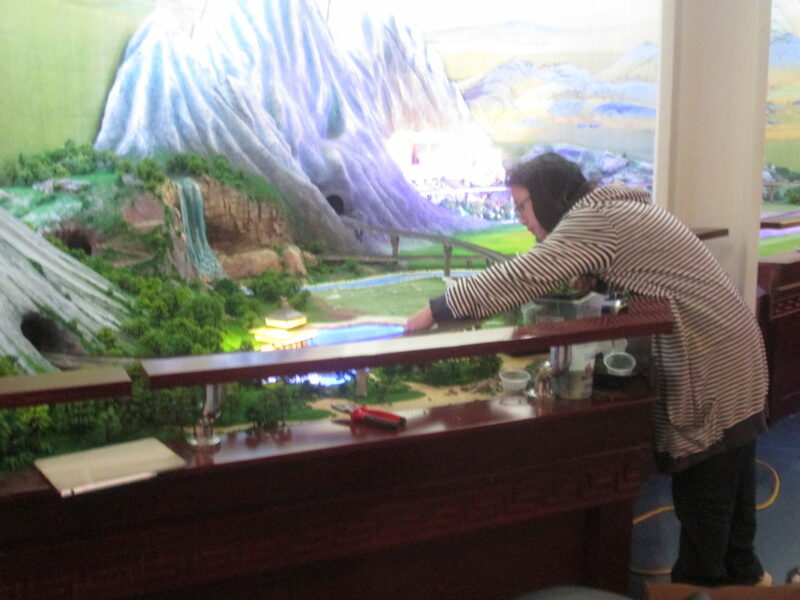 They focus a lot more on the natural settings, though there are some stunning skyscrapers, in addition to the Tibetan monastery with a big line of devotees. Check out the skyscrapers, with lit-up high end advertisements. And the Zhangye National Geopark looks unnatural, but I looked it up when I got home – it’s real. The colors were amazing! Latin America was made in Buenos Aires, with 15 model makers taking 58 days to create it. Iguazu Falls in Latin America is the only area with real water, aside from the Panama Canal also in Latin America (the canal will work – though it wasn’t filled with water when I was there). The falls have lots of little people standing at overview sites, getting wet, of course. You can see the beaches of Rio, along with a Carnival parade. And there’s a little church area near a vacation spot. They have Machu Pichu, but it’s pretty high up and difficult to see. There were some naked people in Latin America (you have to look really closely, though they are on the edge of the observation area). The PR person told me they were native people, but when I looked very closely, I surmised they’re actually nudist vacationers. One appeared to be hitting a volleyball, and others were lying in the grass sunning themselves. I wouldn’t worry that the kids would see much. These figures are 0.8 inches tall. 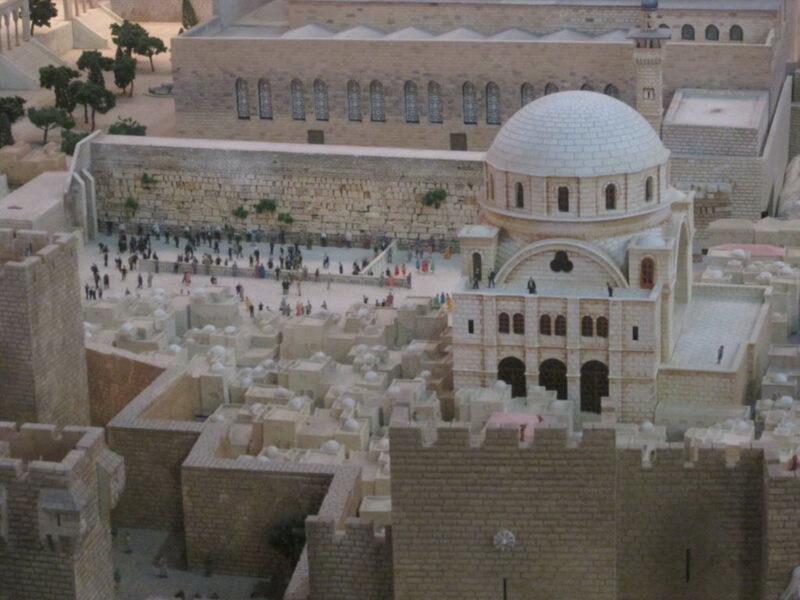 The Middle East was made in Israel, by 19 model makers in 124 days. 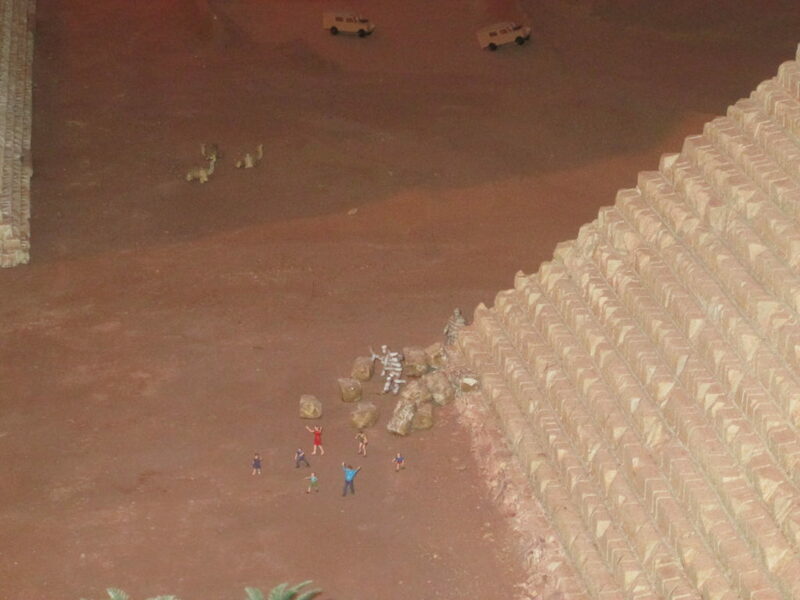 For this exhibit, the Middle East consisted of Saudi Arabia (one Mecca scene), a giant Jerusalem spread, and a small Egyptian pyramid area. I was told I wasn’t allowed to take pictures at Mecca (sorry, no photo! ), though I didn’t see a sign at that time. Jerusalem is very large, with an old city, and newer parts of the city. Look for ancient mosaic floors, a sculpture garden at Shrine of hte Book with the Israeli version of the Robert Indiana Love statue (ahava in Hebrew), rooftop cafes and a fun Monster Park slide (a real thing there). Apparently you can see Snoopy somewhere in Jerusalem (and the gift shop worker, who doubles as an ambassador, says Obama is in there somewhere too. On Yelp I read he’s at a helipad – I could see the helipad by the Knesset in my photos, but couldn’t get good quality when zooming. Let me know if you find him). While not working during my visit, the pyramid closest to you will apparently light up (on the side without stone) and you’ll see the path to the tomb. Look closely at the pyramid, and you’ll see people climbing it. You’ll also see a mummy chasing people. The airport is in the works. I saw them creating the planes in the workshop – if the workshop doors aren’t open, you can still peek through the windows. You can also see the airplane area being created – no photos allowed. The Minatur Wunderland video gives an idea of what you might see in the airplane land. 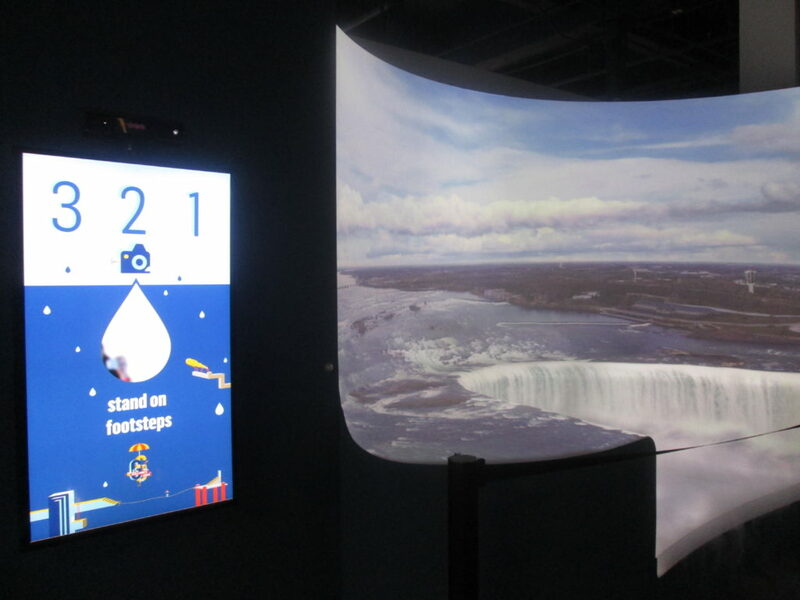 Gulliver’s Gate also plans to create an app that lets you zoom in to see things that aren’t close by, and also to help guide you through the exhibit so you don’t miss anything. For now, the ambassadors (employees walking the floor) can give you lots of tips for things to look at, but you still may not be able to see everything in the back due to small sizes. 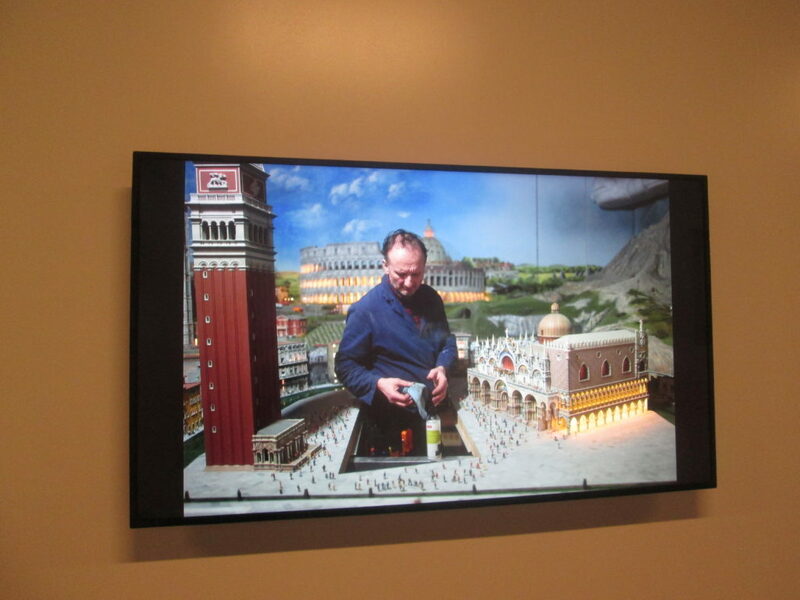 Toward the end of the exhibit, they have some video monitors showing how the models were created and shipped. If the kids aren’t itching to leave, it’s fascinating to watch. The models were shipped to the U.S. in crates. There are several areas in the exhibit where you can watch them creating and fixing things. Videos showing how the models are made and put together. Leave time for the gift shop. 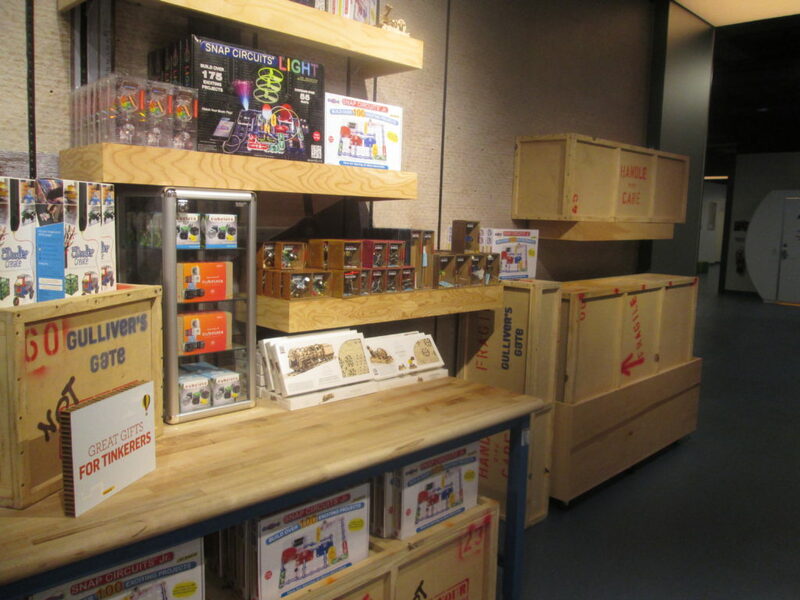 It’s really a great gift shop, with appropriate items, from trains and model train accessories, to 3D printed jewelry. Very nice displays as well. Would kids like Gulliver’s Gate? I think kids would be thrilled by it. Show the website to your child before you go to see what they think. There’s not a lot for a child to “do” there – other than looking at the models. That said, there are plenty of things going on and that your child can discover. So it really depends on your kid and their attention span. 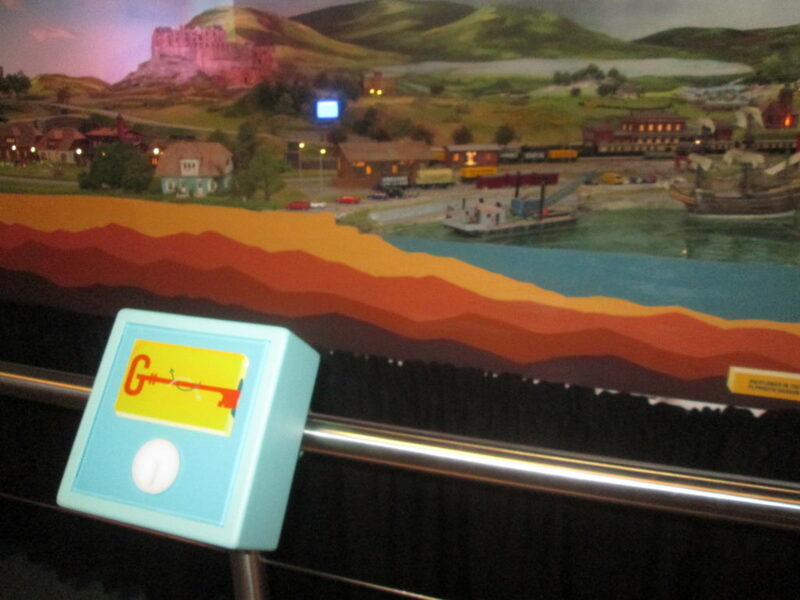 The keys will make it fun for kids, and the map will help as well. Ask the roving ambassadors for tips about things you might have missed. They’ll be happy to point out or tell you about various things that might be hidden. One caveat is that the models may be higher than small kids’ heads. There are some pedestals they can stand on which will help. But you may need do some lifting of them, so they can see what’s going on. 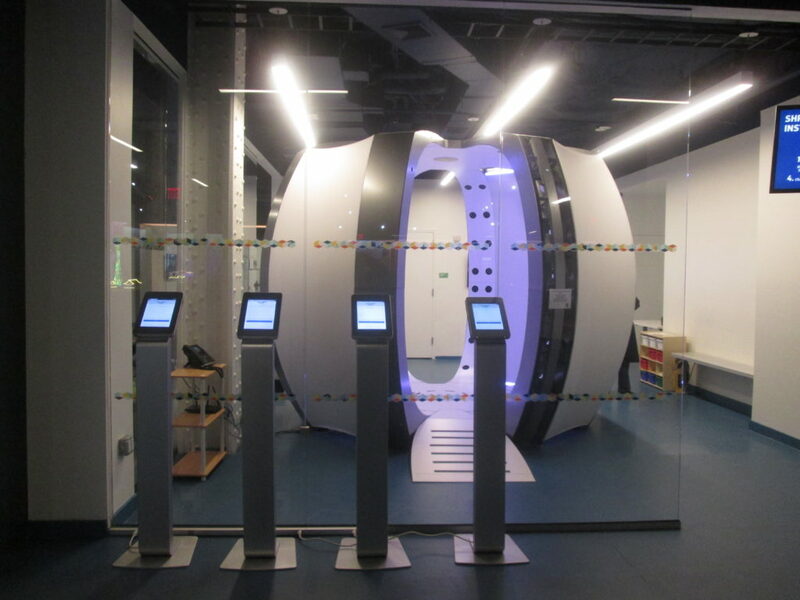 Gulliver’s Gate allows strollers, and also has an enclosed nursing station. They have classrooms for private events and school groups. How long to spend at Gulliver’s Gate? Again, it really depends on YOU. I love miniatures and looking at things up close, so I easily spent two hours, and probably could have spent longer but I got hungry (there’s no café there). Eat before you go, as there are no in/out privileges. Cost: Through December 2017, tickets are $36/adult, $27/senior, $27/kids ages 12 and under. They have group discounts. Save $5 a ticket by booking in advance for a specific time/date. You get a map and key at the admissions desk. Discount Gulliver’s Gate tickets: I’m guessing that deals will pop up from time to time, and I’ll try to post them here. At this time, I found a small discount at 365 Tickets USA, a site I’m unfamiliar with. Adult tickets were $33, kids and senior tickets are $25. At one point, they had tickets on Groupon, but that sold out. Check back there, though, if you’re going. Leave behind: No food, drinks, luggage, backpacks or selfie sticks allowed. They allow you to check bags at the front desk. Disclosure: I was given a press ticket for review purposes. 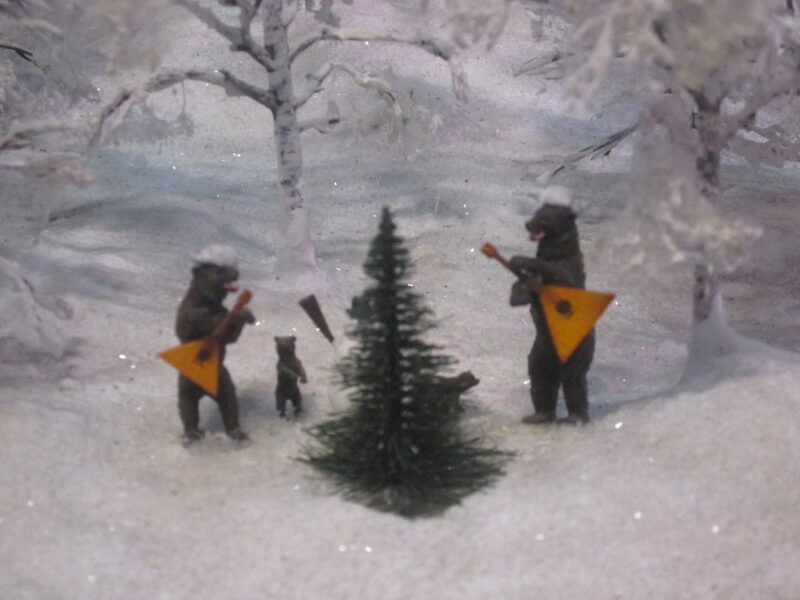 Pingback: See Guliver's Gate holiday figures and discover even more than the 100,000 figures already there. This was a great article which I found after our visit. Your description was so accurate and helpful. I wish I had seen it before we went!!! !